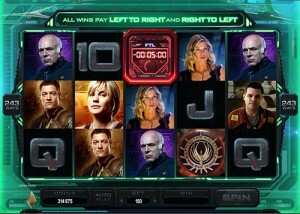 The long awaited Battlestar Galactica online slot was finally launched this week and brings to live the classic science fiction series in true style. The game is the latest in Microgaming’ 243 Ways to Win series. The game takes you through the story of humanity under siege while offering you great bonus features and exciting ways of unlocking new content. 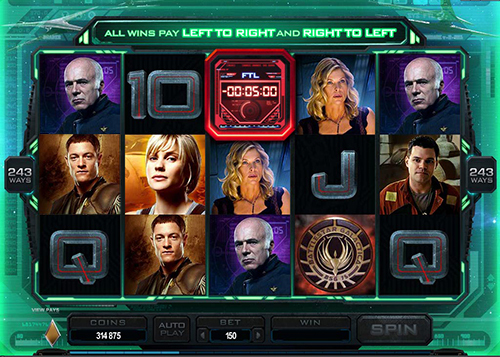 There are three modes of play; Normal Mode includes 15 free spins which award triple payout and Iron Storm which can turn up to five reels wild. In Run Mode all wins pay in both directions and the Jump Feature will turn 10-A symbols into mystery symbols. Finally there is Flight Mode which includes more free spins and symbols randomly turning into wilds and splitting in two. This exciting new slot is available at most Microgaming casinos as both a download version and an instant play flash version. It is just one of hundreds of top quality slots developed by Microgaming all of which provide hours of fun and of course huge pay outs. Be sure to check it out at your favourite online casino and take full advantage all its great features.